Win enough money to start up your own band and chase dreams of platinum albums with the Rock’n’Roller slots game at Lady’s casino. Match up guitars, drums and records at our casino for ladies with Rock’n’Roller. For the gambling woman who likes to sing, Rock’n’Roller is the online casino slots game for her. 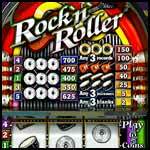 Rock on to try and win jackpots which are just as valuable as a record contract! Rock’n’Roller is your chance to strum a guitar, spin records, and bang on drums in a slots machine quest for the gold. Gambling ladies, if you have ever had rock star dreams, Rock’n’Roller can do a lot to make them come true!